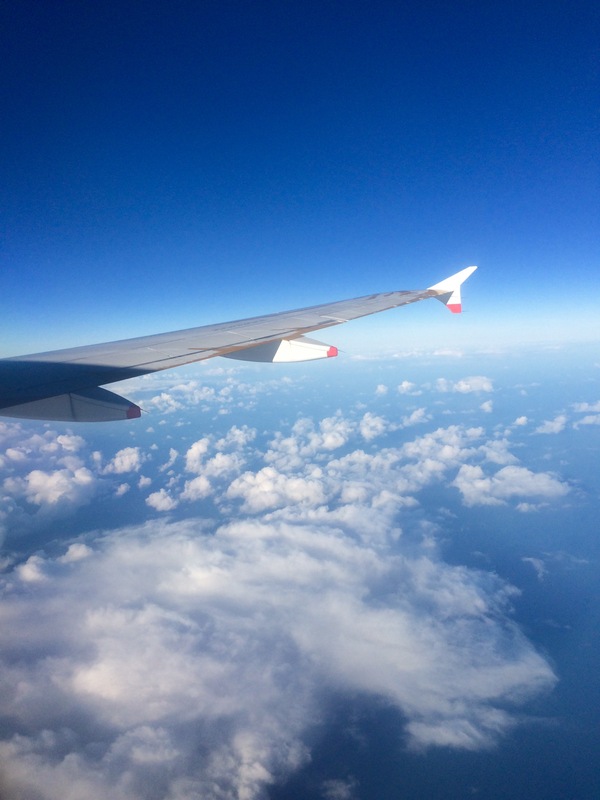 I’ve written about my flight anxiety on here before, where I discuss how my anxieties around flying have gotten worse over the years. The past month I’ve taken many flights, and although a lot of them were bad anxiety-wise, I made it through, physically and mentally. And I’ve had some sketchy flights. I flew while typhoon Nina was in the Philippines (“we might experience heavy turbulence due to typhoon Nina” is NOT something you want to hear your pilot say right before take off) and I witnessed a aborted landing (also called a go-around; basically, as we were about to land in Taipei, literally seconds from touch down, we sharply took off again because there was another plane on the runway. Yes, it was terrifying). As someone who struggles with flight anxiety, these situations really were my worst nightmare. But, for the most part, I was able to somewhat control my anxiety. I’m not going to lie, sometimes I failed and had a small panic attack on the plane, but that’s okay. I’m still learning how to deal with my flight anxiety, and today I thought I would share some of my tips. Of course any form of anxiety is very personal, and while these tips work for me, they might not be for you. But I still thought it was worth sharing; maybe you’ll get some ideas on how to handle your flight anxiety. Remember, you’re not alone! Something that really freaks me out when flying is the sounds. Especially on a small plane, you can hear everything. Whenever the plane slows down of speeds up, I fixate on these sounds and convince myself that something is wrong with the plane, and that we are bound to crash. This can get so exhausting, and so I try my best to wear earphones to listed to music or watch a movie, in a attempt to block out these sounds. It doesn’t always work (sometimes my fixation is so bad that I refuse to listen to anything but the plane sounds), but this is definitely worth a try. Also, if you’re listening to music, try calm music. I like Ed Sheeran, James Blunt and Passenger; this music is calm and doesn’t hype me up too much. Find artists that work for you! I used to have a really bad habit of sitting in a coffee shop with a big soy latte in the departure hall. There were a few reasons I did this. Firstly, I’m usually always tired at airports because I can’t sleep properly the night before. It’s a weird mix of adrenaline from the anxiety and exhaustion from a lack of sleep; it’s horrible. Due to being tired I thought that it was rational to drink coffee, to wake myself up. Another reason was routine; I’m used to coffee shops and their chill environment, and so always gravitated towards them. I’ve now realise that adrenaline cause by anxiety and adrenaline caused by coffee do NOT mix. It only makes it much worse; the last thing you need when you’re feeling very anxious is more adrenaline rushing through your system. I’m planning on writing a ful post about this soon (I’ve pretty much completely cut caffeine out! ), so stay tuned. I now still go to coffee shops in departure halls, because they are calming places for me, but order a juice or a smoothie or a cup of tea. I’ve really noticed a difference doing this. There are a number of reasons for this. The biggest one for me is that sitting by a window allows me to rationalise turbulence. Turbulence is one of the factors of flying that really scares me. When I sit by a window, I can anticipate (for the most part) when the turbulence is going to come. For example, if we are in the process of landing and I can see that we have a thick cloud blanket to go through, I can prepare my mind and body for the turbulence that is bound to hit. I don’t know if that makes sense, it’s hard to explain, but this really works for me. There are also other reasons to sit by the window. On long haul flight, I find window seats more comfortable, as you can create a small little “cave” for yourself. You can turn towards the side to sleep and experience a little bit of privacy. Comfort is key for anxious flyers. A window seat also offers some amazing views, it will allow you to witness some of the beauty that comes with flying. Seeing the white fluffy clouds is quite magical, and seeing your destination come closer and closer when landing is pretty cool too. Try to focus on these good things, in order to take some of the edge off your anxiety. Here I’m not talking about looking at past plane crashes and such; please, don’t do that! I’m talking more about “knowing your fears”. For example, turbulence is a big trigger for my flight anxiety, so I decided to do a bit more research into what it really is, and why it happens. I find this video particularly useful; in it a pilot talks about flight anxiety, and how to overcome it. He compares turbulence to a car driving over a cobble road, it’s a bit bumpy but it’s not dangerous. I try to remember this when my plane hits some turbulence: I close my eyes and pretend I’m in a car, and it helps me normalise it. This is just one example that worked for me. There’s loads of videos out there that aim to help with flight anxiety. A lot of them are presented by pilots, so you can bet they know what they’re talking about. I suggest checking a few out, but again, steer clear of any “air crash investigation” stuff! Tying into the above tip; know the stats! There are around 100,000 flights a day, isn’t that a crazy amount?! If you then compare this number with the amount of accidents, it’s so minimal. Now I’m not saying that knowing this fact should eliminate your anxiety, because it definitely doesn’t for me. Unfortunately, most anxieties are not rational; we might realise that flying is one of the safest modes of travel, but we can still be petrified of it. However, sometimes when I’m feeling very anxious on a flight, I repeat this number to myself over and over. “100,000 a day, 100,000 a day”. Sometimes it helps, sometimes it doesn’t. But it’s good to know, and maybe it can help some of you. And lastly, whenever you’re flying or about to, think about WHY you’re flying. To alter an existing saying: “focus on the destination, not the journey”. If you’re going on holiday, think about all the amazing things you’re going to see and do. Maybe download some pictures of your destination on your phone beforehand, so that you can look at them to remind yourself of why you are on a plane. If you’re on your way back, look at pictures you took while on your trip, and remember that the anxiety you feel now was worth it, because you experienced some new amazing things. I realise that this tip doesn’t really work if you’re flying for business purposes, but I still suggest that you always think about the destination, what you’re going to do once you land etc. It can keep your mind off the present flying situation. Sorry for the long ramble, I hope at least some of it was useful! I would love to know some of your tips on how you deal with your flight anxiety, or just anxiety in general. If there’s is anything I want you to take away from this post, it’s that you’re not alone in anxiety.